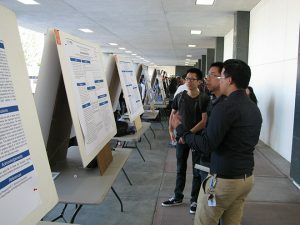 The 13th annual College of Science Student Research Day held May 5, 2017 had a record turn-out with 75 posters presented. Students from every department in the college presented their latest research results to students, faculty, administrators, and guests from local scientific companies in an inspiring exchange of ideas. Kudos to Prof. Roy Okuda for organizing this wonderful event. View some photos from the event. On Tuesday April 13, the College of Science held its first “Tapas Talks”. 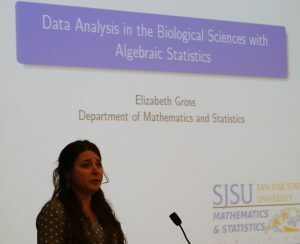 Between 50 and 100 students, faculty, and other guests gathered to hear a series of 5-minute “bite-sized” research presentations by 25 College of Science faculty. The topics ranged across the disciplines in the College and included fascinating discussions of internet security, assessing seismic risk, fetal alcohol syndrome, planet formation, and many more topics. The afternoon was deemed a great success and the College will likely make this an annual event. Here are some scenes from the event.